This is probably bordering off-topic, because it is not a synth, so mods: feel free to move it. 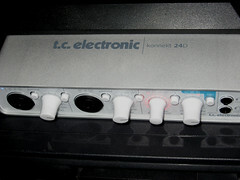 Can anyone provide some useful information on this audio interface (Focusrite Saffire LE)? I've read a few magazine reviews, but they did not provide anything that can't be found on a spec sheet from Focusrite. I'd like to know about the quality, which I assume is pretty high based on my experience with their other products. I really need to upgrade my cheap 2/2 M-Audio interface to something that doesn't crackle and sound muddy. Other suggestions are very welcome, too! Sound production would be the right place for it. 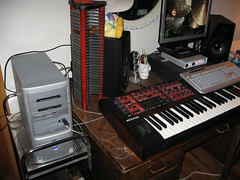 Haven't used the Focusrite sorry but my M-Box did have Focusrite pres in it. They weren't very good, I think Focusrite realised a few years ago they could make more money lending their name to cheaper products than focussing (ha!) on the good stuff they had been making. That said, it'd probably be better than the M-Audio. However crackling is usually caused by driver/computer problems rather than the actual unit itself. Have you got the latest/right drivers for your M-Audio unit? Have you got plenty of ram in your computer? Have you tried increasing the hardware buffer size to get rid of the crackling? None of this will help the muddiness though. I'd have a look at the Presonus Firebox too, I think they look like great value for money and have heard good reports on them, although haven't used one yet. Oh and what computer are you using? (ie Mac/Windows, processor speed, ram, sequencer software) This will make a difference as to what will work best for you. Oh, I haven't been on here for a while, didn't notice the "Hangout Lounge". Sorry 'bout that. I'm on a macbook, plenty of ram, etc. About the crackling, it's mainly analog, something's screwey inside. The latency isn't good enough either. It's an overall very cheap design though, I'm done with it. I've heard mixed thoughts on that Presonus. I know someone who bought one, faulty, had to return it, faulty again, returned that, and now he's very, very pleased with the current unit. I'm not into that kind of hassle, personally, but it works for some people i guess. Rare occurence I'm sure though. If you're on a Mac I'd highly recommend a Motu interface, is the Ultralite within your budget? The Motu drivers are great on Macs, at work we have lots of Macs (10 or so) and have a few different interfaces from Motu, M-Audio, RME and others. The Motus have been trouble-free since I've been there, as has the RME but it's a PCI model so not really applicable for you. I also use an 828mkII when I play live with my band and it's great. The latency is low enough that we can do vocal effects in Live and you don't hear the latency. I think Pighood has a Firebox on his Mac and likes it a lot. I got a Firebox a month ago and have been using it alot since. It's great! No lowdowns at all, and the buildquality is great. I got the 24D and it works great but still working out the kinks. Though the sound is great but then again I have them to A7's. looking. Don't own it so can't say much on it. I have a Saffire LE and I'm very happy with it, I think the pre's are good although I don't have any fancy high end stuff to compare it to. had to register the 3 times on my desktop pc and 2 times on my laptop to get it working, but then I ditched them because they aren't any good IMO. But all in all I think its a good Audio interface for the money. my brother has the DSP version and the software is a horrible, unintuitive, buggy mess. it crackles all the time and seems to pick up loads of interferance, it often won't output audio on it's internal audio drivers until you restart. it has loads of problems basically and i don't know if it's just the unit one he got. but aside from the problems, the mixer software they came up with is just so unintuitive for anyone who has actually used a real world desk before, it's really hard to follow the signal path and where exactly the routing is taking place. on the plus side, the compressor and eq sound quite good. Sequential Circuits Pro-8, Rolands TB-303, MKS-80, JX-8P, SH-09. Waldorfs Microwave XT, Pulse. Yamahas RS7000, A4000, DX-200. 2 x Cheetah MS-6. Novations Supernova 1 & 2. Korg ER-1. Creamware Pulsar 2.
fingerbib2000 wrote: my brother has the DSP version and the software is a horrible, unintuitive, buggy mess. Hmm, I'd heard that from someone else too. Which is one reason I went with the Presonus Firepod. A lot nicer than my old Edirol UA25, which was an arse in a shiny box. on the firebox. the pres are decent and the thing is a breeze to setup and use. i'm using asio drivers in sonar and haven't had any issues yet.